Having a newfound dependency on the mobile web, internet users are increasingly looking for shortcuts and the easiest way to get things done. For example, our GPS devices automatically know where we are – providing us with driving directions instantly or the location of the nearest hamburger joint quickly – without having to think much about it. 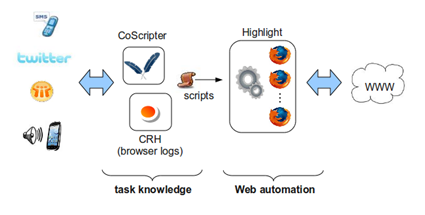 And now, IBM Research has taken web automation technologies one step further, with IBM CoScripter Conversational Interface: an Intelligent Assistant for interacting with the Web, nicknamed CoCo for this blog entry. This new tool originated from CoScripter, a system for recording and automating repetitive activities on the web, such as paying a monthly credit card bill, requesting a vacation hold for postal mail, or checking flight arrival times. With CoCo, you can do all of this from your mobile device. 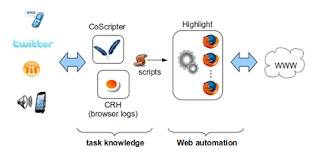 CoCo brings together web automation technologies – CoScripter and Highlight (http://www.almaden.ibm.com/cs/disciplines/user/#highlight) – making the web available to the user’s command through any simple text messaging interface. With this, users can, for example, send an SMS to CoCo and ask it to do something on the web, without actually being in front of a computer. CoCo sends the result back to the user via SMS, e-mail, etc. Whenever there is a need for clarification or confirmation, CoCo can dialogue with the user to ask for additional information. In this way, CoCo becomes a communicative assistant with which you can talk to get computing tasks done. IBM researchers Tessa Lau and Julian Ariel Cerruti presented this paper, “A Conversational Interface to Web Automation,” at the 23rd ACM UIST Symposium in New York City on October 5. Co-authors are Guillermo Manzato, Mateo Bengualid, Jeffrey Bigham, and Jeffrey Nichols.